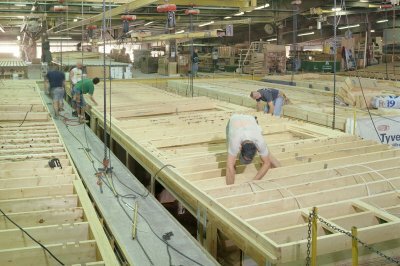 Excel Homes shared these photos from inside one of their three modular home factories. Enjoy. 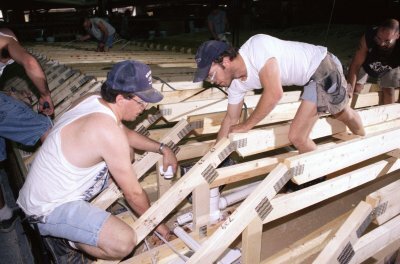 Here Excel Homes workers are performing work on the ceiling of a module. Trust me construction workers perform better and faster when they are in a comfortable environment. Now they have started work on a hinged roof. The hinged roof allows modular homes to be transported on narrow roads and still have a steep roof pitch like stick-built homes. 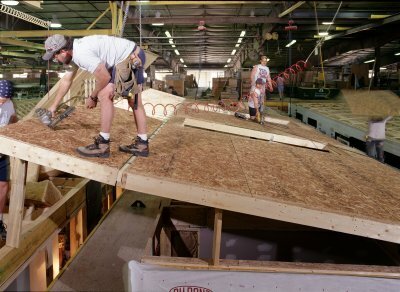 Also notice how the power nailer the builder is using is attached to the roof of the factory. Workers continue on the hinged roof. 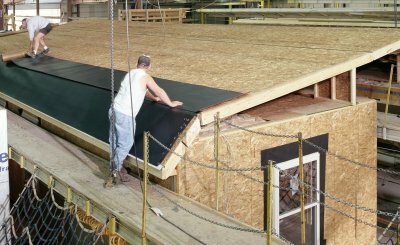 Here they are adding an overlapping protective layer to seal the roof after it is lifted into place at the building site. Builders are placing piping trough the framework. You can also see some of the reinforcement that has been added to the framework. 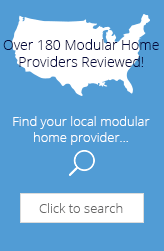 This section of our website is devoted to user submitted pictures of modular homes and the modular construction process.